Three reasons we at Live The Pet Life love fall: 1) Pumpkin spice everything. 2) College football. 3) College football (you can really never have enough college football). Handsome Dan, the Yale Bulldog, has the honor of being the first live college mascot in America. The original Dan was gifted to the school in 1889 by a student, starting the lineage of now 17 Handsome Dans. The number-one reason we love him? He’s a philanthropist and humanitarian. Dan XIII alone raised over $10,000 for charity! Fun fact: Handsome Dan XVII’s “home” name is Sherman. At first you may not recognize the name Traveler, but we’re sure you’ve seen him. He’s the white purebred Andalusian horse that the USC Trojan warrior rides in on before every home game. But Traveler has also, uh, traveled far and wide. In 2005, he made an appearance at the Orange Bowl in Florida and he’s a common sight at the Rose Parade, riding in each of the last 47 of them. Traveler also has the honor of being immortalized in his own statue just across from the famous Tommy Trojan statue in USC’s Hahn Plaza. Uga might be the best-known real-life college mascot of all. 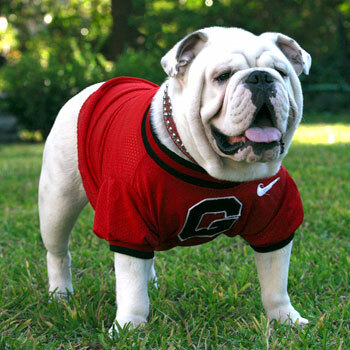 With his red Georgia jersey (which is made of the same jersey material as the football players’ jerseys) and spiked collar, Uga is at each of the Bulldogs home games, rooting his team on. Usually he sits near or on bags of ice, as English Bulldogs can easily get heat stroke. Creepy fact: Previous Ugas that have passed away are actually buried in marble vaults within Georgia’s football stadium. According to the Pittsburgh Press, Georgia is the only school to do this. 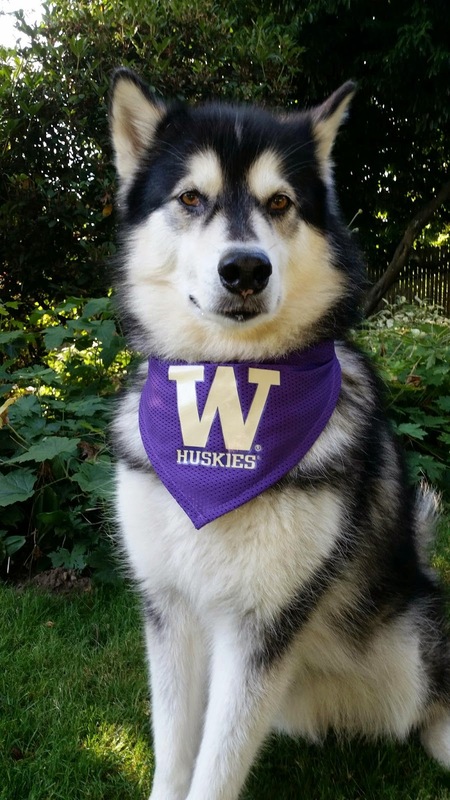 Not to be confused with the plush Harry the Husky, who is an anthropomorphic husky and the official mascot in costume, Dubs is the official live mascot of the University of Washington. When he isn’t leading the Huskies football team onto the field at home games, he’s writing on his official blog and sharing photos on his Twitter and Instagram pages. Who needs opposable thumbs to tweet, anyway? Dubs comes from a long line of real-life Husky mascots, dating back to 1922 when a fraternity on campus adopted a puppy who became known as Spirit I. Yes, you read that right, there is a live Bengal Tiger living in Baton Rouge. In fact the tiger, Mike VI, resides next to Tiger Stadium, which is affectionately known as ‘Death Valley’ (no, the stadium didn’t get its nickname from the fact that a tiger lives next to it). Mike occupies a state-of-the-art tiger habitat when he’s not at home games, bringing good luck (it’s a growl-based luck). 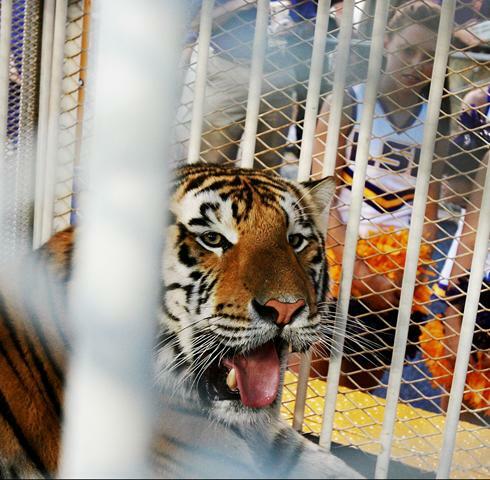 Probably the craziest fact ever: Mike VI’s cage is parked next to the visiting locker rooms pre-game. All of the visiting players have to walk right past Mike to get to their locker room. Talk about intimidation tactics. So these are just a few of our favorite of the numerous live mascots in college football. Do you have a favorite? Share it with us in the comments!